I’d promised my dad to bake him a cornmeal cake ages ago – and he’d ask me about the cake every chance he got. I have a good friend who knows all about Brazilian cornmeal cakes – she’s baked several different recipes, all of them with beautiful results. I used one of her recipes. What a delicious cake! 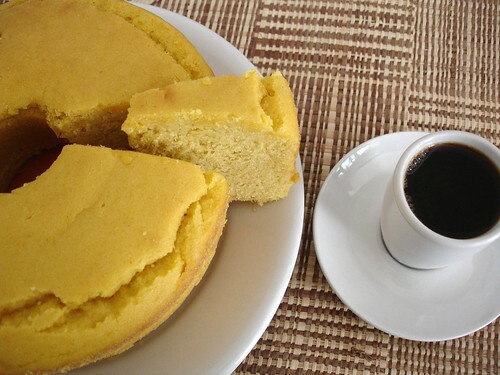 Since the cornmeal is cooked with the sugar, milk and oil, the result is a very moist cake. My father loved it and said that he can’t wait for me to bake and send him more cakes like this. Pre-heat the oven to 180ºC/355ºF. Grease a 24cm ring pan and sprinkle with cornmeal, shaking well to coat the whole pan. Shake it to remove any excess. You can bake this recipe in muffin pans, if you wish. Place the cornmeal, sugar, milk, oil and salt in a large saucepan and mix well until the ingredients are dissolved. Cook this mixture over medium/high heat, stirring constantly so there aren’t any lumps, until thick and creamy – it will resemble soft polenta. If lumps are formed, stir quickly clockwise and then the opposite way – I used a whisk and it worked really well. Pour the mixture in a bowl and set aside to cool. When it’s cool, add the eggs, one at a time, and mix well after each addition. Add the baking powder and mix well. Pour the mixture into prepared pan and bake for 40-45 minutes or until a skewer comes out clean. Let it cool in the pan before unmolding it. This sounds like a delicious, substantial cake--and not too sweet, I'm guessing. And it looks gorgeous unadorned; I'm a big fan of unfrosted cakes. I've never made a cake with cornmeal that didn't also have flour. I will definitely have to try this, as I have in my refrigerator a bag of locally ground cornmeal that was given to me by one of my blog readers! Now I know exactly how I'll use it. Thank you for the recipe. I've tried a few Italian recipes of cornmeal cakes, actually they don't seem much different from yours! I just love this rustic cake, geniue to taste! Yum, looks delicious and satisfying! I have bought some cornmeal recently with mind to making a cornmeal cake so now I have a recipe! The cake looks fantastic as I sit here and eat my corn bread muffin! Now I know what I'll do with that cornmeal in my pantry! This looks like it might be an upscale version of cornbread, which I adore, and which never takes frosting. I love this post Patricia! After tackling my first olive oil cake, I told my dad I needed to make one with cornmeal next. Here you've given me the recipe! Thanks, what perfect timing. 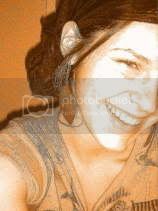 You are such a sweet daughter :). I love almost anything with cornmeal and i think this will be no exception! This looks like such a homey eat-everyday cake ! Terry, you can decrease the amount of sugar if you want to. My father loves sweet things! 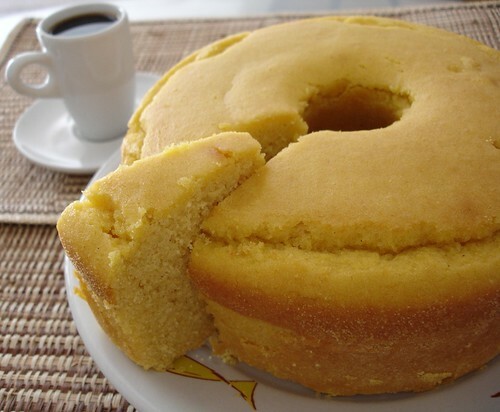 This is a great cake to have with black coffee. Lydia, I hope you like this cake, dear! Gattina, in the region where I live there's a big concentration of Italian descendants - we have much of their influence in our cooking. Maybe that's why the cakes are similar! I'll make the cheese rolls soon and post them here. Freya, let me know if you like the cake! Bradley, thank you! And tks for stopping by, too! Toni, you are so sweet! Beijos, querida! How nice of you to "say" that, I really appreciate it! Ooo, that looks really good, especially with the cup of coffee sitting next to it. I swear I can almost smell the heady aromas! That looks delicious and so fluffy! Oh my gosh... I would love some of that with a little bit of honey butter on it. It looks so good Patricia! Ari, thank you! I like cornmeal a lot, too, and like you don't use it as much as I would like to. Lis, you're so sweet, tks!! Anh, I hope you enjoy this recipe! Kristen, honey butter?? It sounds wonderful!! Juliana, not a cake fan? What about bread? I'm curious, let me know what kind of recipes you'd like to see around here. It does look good, and like TerryB, I like it unfrosted. Your photos are inspiring, too, Patricia. I'm trying to stay away from sweets, but your blogs makes me fantasize. looks creamy! and with that coffee!? perfection! i don't like cakes with lots of layers since i was a child (but i'd add "goiabada" to the cake!). i don't like "brigadeiro" as well. oh, i love breads. and pastries. I've never made a cornmeal cake, but yours looks really good. I love how smooth the top came out, it's really pretty! Oh, lovely - like other commenters, I've never made a cornmeal/polenta cake without having some normal flour in there too. I've been tempted to try, but never quite been brave enough. I just made this and it turned out great! I was worried because I don't think my corn meal is "fine" corn meal, but it still worked. I only baked it for 35 minutes. It is essentially like cornbread, but I'm thinking that's because I didn't use fine corn meal. Hi...I just wanted to say that I loveeee this cake. I just tried it for the first time, took it out the oven about 20 minutes ago. It's moist and not too sweet. I added some vanilla to it and I liked that it was quite easy to make. Would make it again and again. That is great news! I am so glad to know you liked the recipe, and vanilla sounds like a perfect addition to this recipe - thank you for letting me know how the cake turned out for you!